When it came time for Tawjihi, Rawabi did not know what to do. 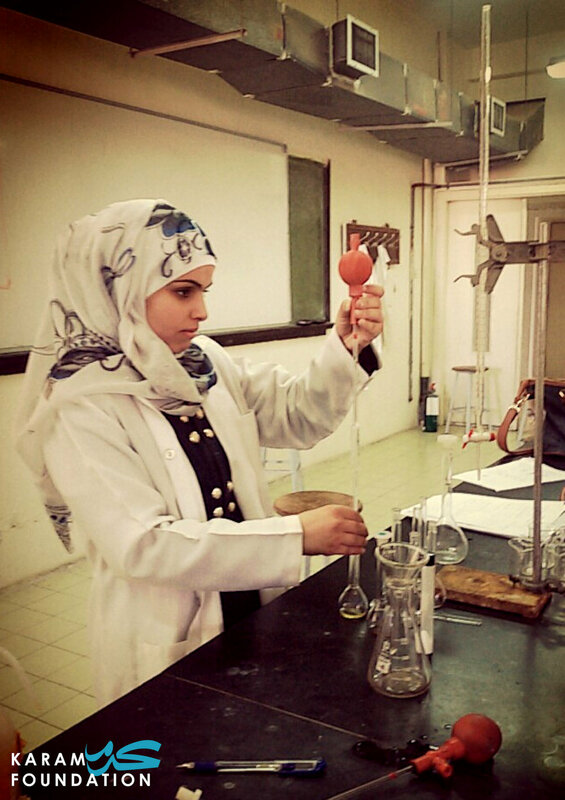 She and her family had fled Homs in 2012, before she was able to complete her baccalaureate. The Jordanian educational system was different than she was used to and she knew she could not afford the special courses and tutors that many deem necessary to pass. “I made it my goal to succeed. I would work at all hours, studying. I even managed to save some money to go see a math tutor a few times -- it was the subject that I struggled most in,” she says. She worked hard, and took the Tawjihi. The day the test results came out, she was on her phone at her parent’s house, trying to load the results. The internet at their apartment in Mafraq wasn’t loading. Her brother, remembering a neighbor with better internet, ran over to check for her. “He called me, and said “Mabrook”. I immediately started jumping up and down and crying. I didn’t even ask him what my score was. Knowing that I had passed was enough. It was later that I found out that I had gotten 80/100 on the exam, which is the best score I could have hoped for as a Syrian student in Jordan who does not have resources for special courses,” Rawabi told us. Though her high score on the exam meant she could have her pick of universities and fields of study, Rawabi wasn’t sure if she would be able to attend university. Tuition costs in Jordan are widely acknowledged to be astronomical, especially for most Syrians who are not legally allowed to work in Jordan. As her family wondered how they could afford the costs of university, Rawabi’s cousin, a Jordanian/Syrian, posted about her on facebook. He merely mentioned how proud he was of his cousin, for overcoming huge difficulties and passing the Tawjihi. A private donor saw the post, and called Rawabi. “When we got the phone-call, it was amazing. They said, “We want to come visit you.” So they came, and they told me that if I am able to pay 50% of the tuition, they would cover the rest,” she recalled. Rawabi jumped at this opportunity. However, this still proved to be too difficult for her family. Every semester, they struggled to make ends meet and gather enough money to cover the rest of her tuition. Now in her last year, Rawabi has settled in: she routinely makes the Dean’s List and Honor Roll at the college, and is on track to graduate with honors. This past summer, she completed the practicum required of her as a Pharmacy student. She learned how to work in a pharmacy setting, how to interact with patients, and how to prepare medications.